A mass murderer's daughter, abandoned wife, and Queen of a divided land: the perfect catalyst for war. Now she must stop the ruin she helped create, but how do you fight what you are fated to fail? "I murdered a man and made my husband leave the night before they crowned me." Born under the crumbling towers of Oren-yaro, Queen Talyien's life unfolded like a storybook. The shining jewel and legacy of the bloody War of the Wolves that nearly tore her nation apart, her marriage to Rayyel, the son of her father's rival, spoke of peaceful days to come. But all storybooks must end. Rayyel's sudden departure before their reign began created fractures that left the land as divided as ever. 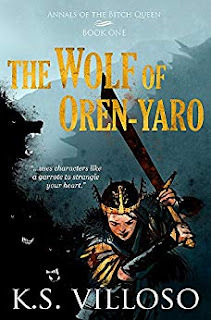 The Wolf of Oren-yaro is an engaging read in a fully realized, complex world of varied Asian-inspired cultures and nations. In the story, some tribes are less "civilized" because they think magic is evil. Talyien is queen of such a nation, and she has to travel outside her homeland in an attempt to meet with her estranged husband. Their wedding united two warring countries, and they were supposed to rule together. But five years ago, her husband abruptly left, and she's ruled their court in solitude since. Afraid her advisors would not let her go, Talyien takes a small group of guards and leaves to find her husband, Rayyel, and bring him home. Far from Oren-yaro, in a foreign land she does not know, her plan gets thwarted when assassins intercede. Now lost and alone, she has to endure many unqueenly hardships to seek allies and survive the schemes of her unknown enemies. Will she find Rayyel? What would she say to him after all this time and distance? Can Talyien accept whatever part she played in his leaving? Much is left unresolved at the end of the book, which I can only assume will continue to be explored through the series. This is an immersive story, told in 1st person through Talyien's POV. Nothing is clear cut for Talyien, and the feelings and decisions she must face grow continually more complicated. On top of the intricate politics, the story has true heart and a raw emotional journey.